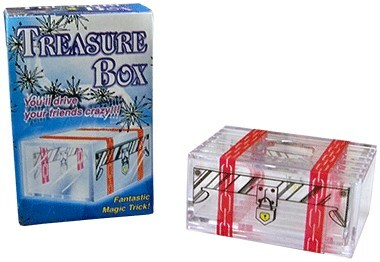 A magician borrows a spectator's object, placing it in the Treasure box. When members of the audience are asked to open and retake the object, no one but only the magician is able! You can use coins, notes, rings or any other objects that you like. You'll drive your friends crazy! Comes complete with Treasure Box and instruction sheet. Dimensions Approximately: 3" x 2" x 1.5"